Michael Goldstein graduated from Michigan State University with a degree in accounting and a minor in engineering. After graduating, he worked for Steel Products Engineering Company (Speco) in Springfield, Ohio (a gear transmission sub-contractor of Bell Helicopter), and later at Daldi & Matteucci (Demm) in Milan, Italy (a gear machinery manufacturer). In 1964 he joined his father in business at Cadillac Machinery Co., Inc., with his specialty being gear manufacturing machinery, especially Gleason bevel equipment. From 1974 to 1984, he was director and partner of Industrial Plants (UK) Corp. Ltd., a major industrial auctioneering company in Europe. Michael Goldstein has also been an active member of the Machinery Dealers National Association (MDNA), of which his father, Harold and grandfather Charles were founding members in 1940, and of which Harold was National President. Michael has been an active member since 1964 and was on the National Board of Directors from 1976 to 1993 and was a member of the Executive Committee from 1980 to 1993. He has held numerous positions, including President of the MDNA's for-profit subsidiary, Machinery Dealers Information Systems (MDNIS), the publisher of the Locator of Used Machinery. In 1985, he headed the group that developed an electronic mail system, "SUPERMATE," for the used machine tool industry to provide a nationwide network for locating second-hand machine tools, similar to what today is called "e-mail". 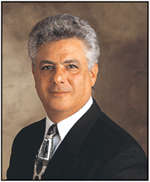 In 1985, MDNA presented Michael Goldstein with the Distinguished Service Award. Michael also served for 22 years on the council of the European Association of Machine Tool Merchants (EAMTM) from 1989 until 2010 and has been an association member since 1975. In 2003, Michael was honored as a Fellow of EAMTM, organized in 1940, only the 19th person and only the second non-European to have been given this award, for his contributions to the association. Michael has also been a member of the American Gear Manufacturers Association since 1987. Like his father, Michael Goldstein has contributed to many areas of advancement in the industry. In 1984 he realized the need for greater dissemination of technical information for the gear industry. In response to this need, he founded Randall Publishing, Inc., and began publishing the award-winning magazine, GEAR TECHNOLOGY, the Journal of Gear Manufacturing, which has readers in 65 countries and of which he is the Publisher and the Editor-in-Chief. In 2007, he started POWER TRANSMISSION ENGINEERING magazine, of which he is Publisher and Editor-in-Chief. In 2012, he started GEAR TECHNOLOGY INDIA, where he is Publisher & Editor-in-Chief. Cadillac Machinery was closed in 2009, as Michael tried to move into a form of retirement, and to concentrate on his growing publishing company.